Croc diving season 2012 started on a high note with some fabulously cooperative and camera happy crocodiles all performing well for the wonderful Liz Hayes and crew from 60 Minutes Australia. Much to our surprise (and theirs) we managed to tick every item off their rather extensive wish list - including a scientific first - without any fuss and they left with happy memories, big smiles and a good show in the bag. Once again we are here with Dr Adam Britton and we have managed to show that it is possible to get a genetic sample from a crocodile in its natural habitat without causing it any pain or angst, or in fact without it even noticing. 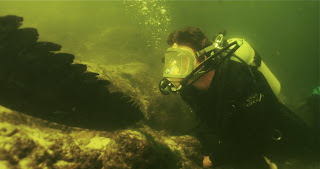 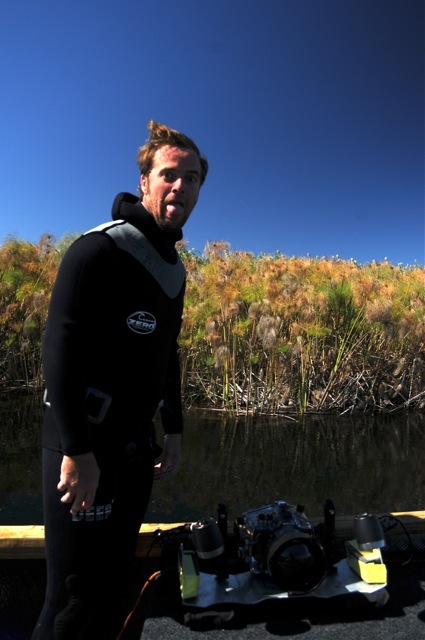 Adam arrived with the desire, and the tools, to cut a tiny portion off the top of a tail scute of a wild croc underwater. We all knew that in theory it could work and were thrilled when he succeeded on his first attempt with a very obliging 2-metre specimen and all cameras rolling. 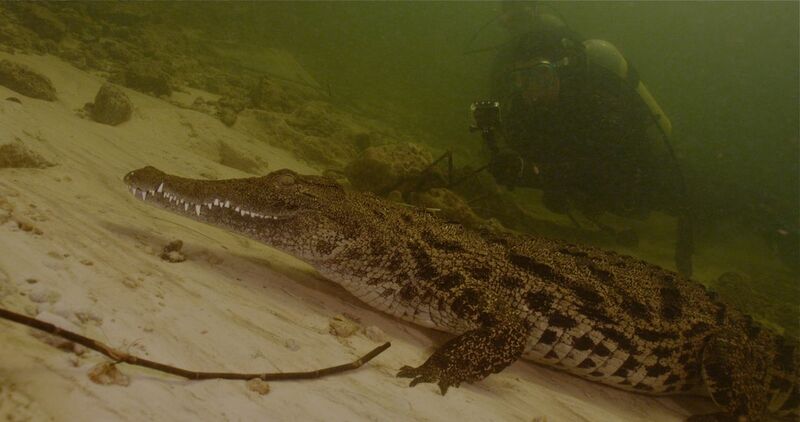 We, and the crew, were even more thrilled when on his second attempt he succeeded in cutting a tiny portion off the tail scute off an enormous 4 metre plus male crocodile. 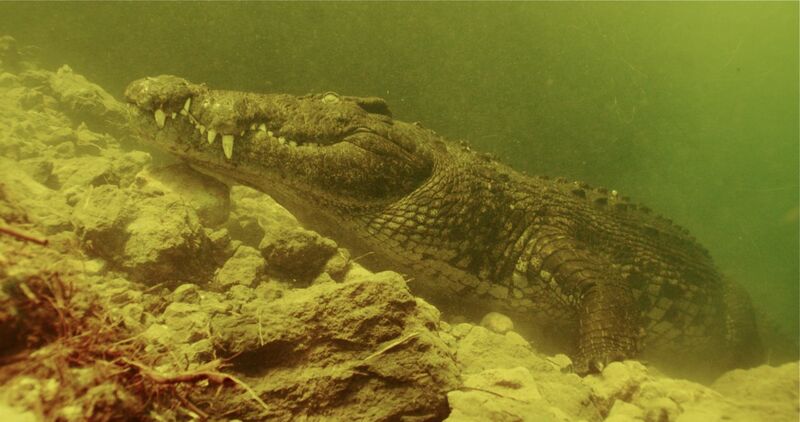 It really is that easy to obtain vital genetic information on crocodiles without putting them through the trauma of capture and manhandling on the boat. 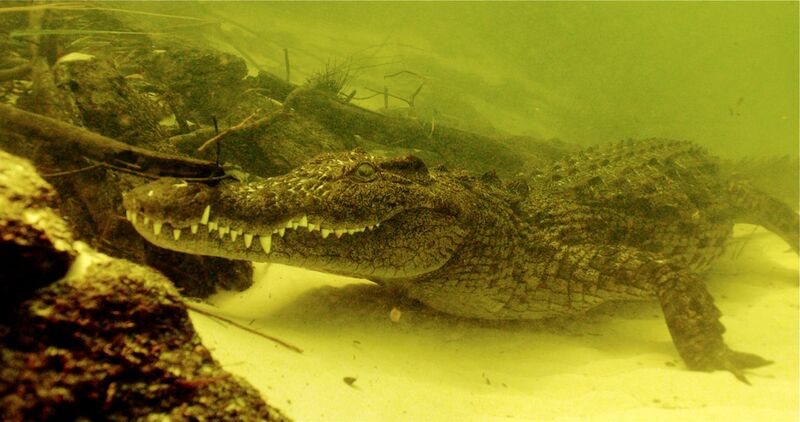 So the plan is to keep going to ultimately build up a database of information that will give us valuable information about the genetic variation in these crocodiles. 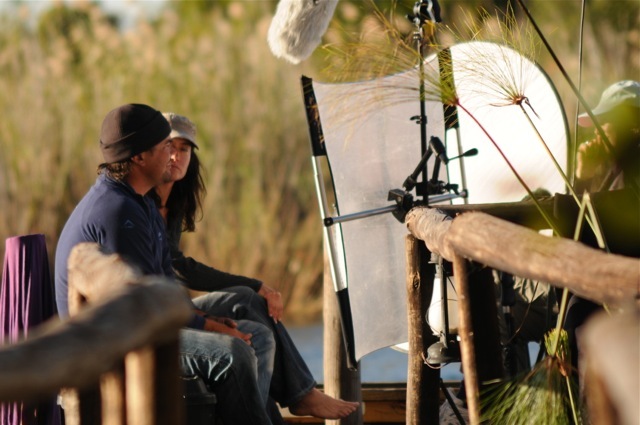 This year (with 5 shoots in 6 weeks) we have wised up to the amount of work involved and have Richard Uren in tow - mainly so that Brad and I can do all the glamorous bits in front of camera and he can do the hard slog behind the scenes – which is proving to be an excellent decision. 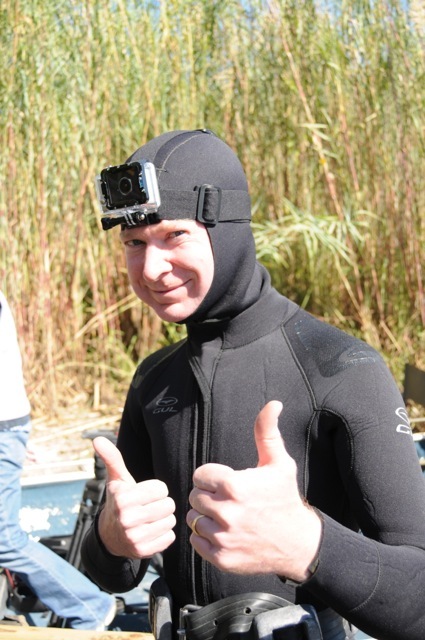 So far Richard seems to be enjoying it despite being dive guide, dive assistant, cameraman, camera assistant and occasional kiddies toy all in one. 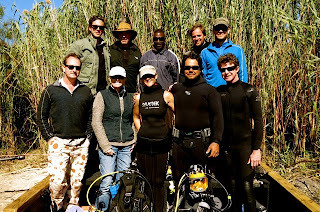 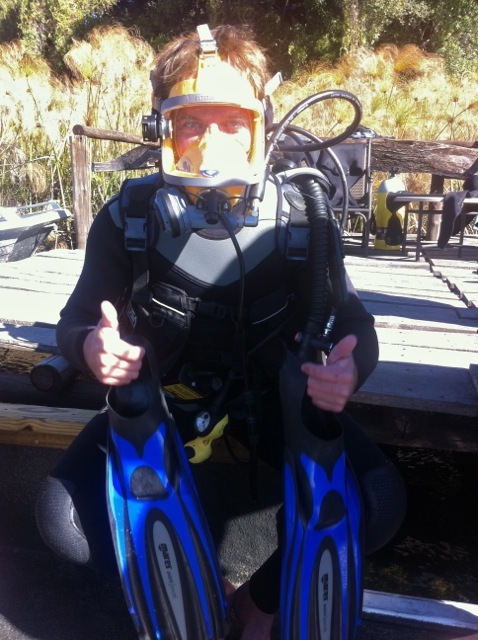 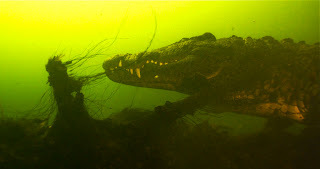 He proved that he has the temperament for the job when on his first orientation dive in the Nxamaseri channel he and Brad totally unexpectedly encountered an itinerant 4 metre croc head on at the bottom of a deep dark hole. 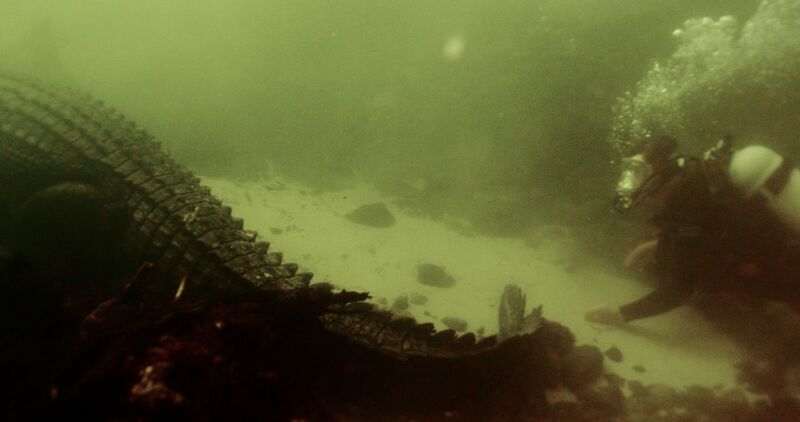 In 10 years of diving Brad and I have never seen a large croc in the channel and Richard demonstrated much presence of mind considering this was possibly the last thing he expected to see on this dive. 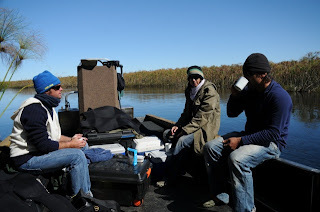 Trying to get warm before diving on the coldest day of the year.